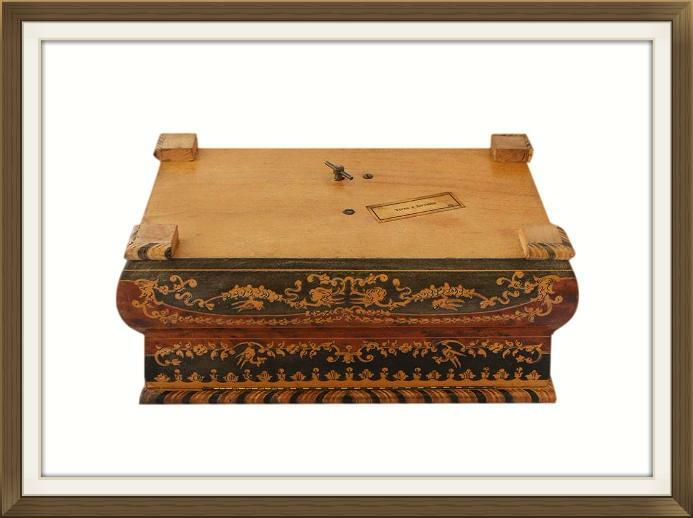 This is a beautiful vintage musical jewellery box, made in Sorrento, Italy, and dating to the 1950s. It is elaborately decorated and plays the beautiful tune 'Torna a Sorrento'. Further details of this are below. The box also boasts a fully working lock and it comes with a replacement fitted key. 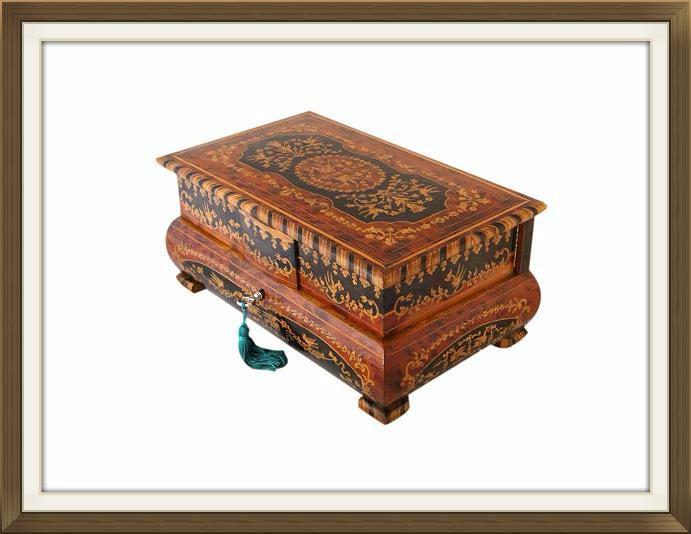 This box has a beautiful Burr Walnut veneer and is highly decorated with marquetry inlay. The inlay is made up of several varieties of wood, and covers the lid and all four sides of the box. 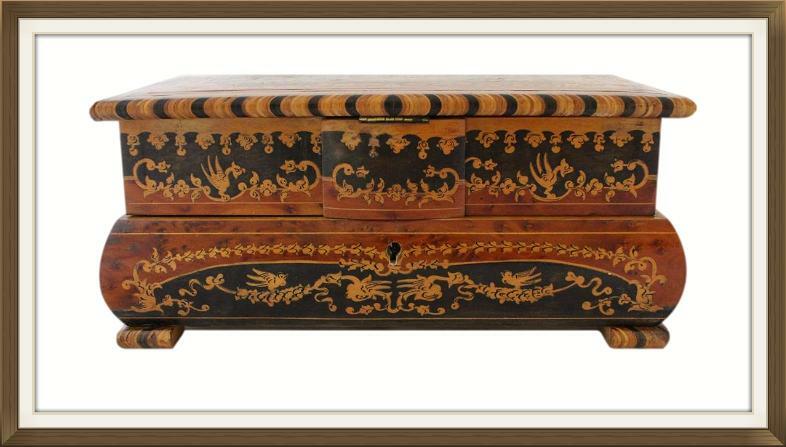 The marquetry features birds and flowers, and also mythological Griffin like creatures. 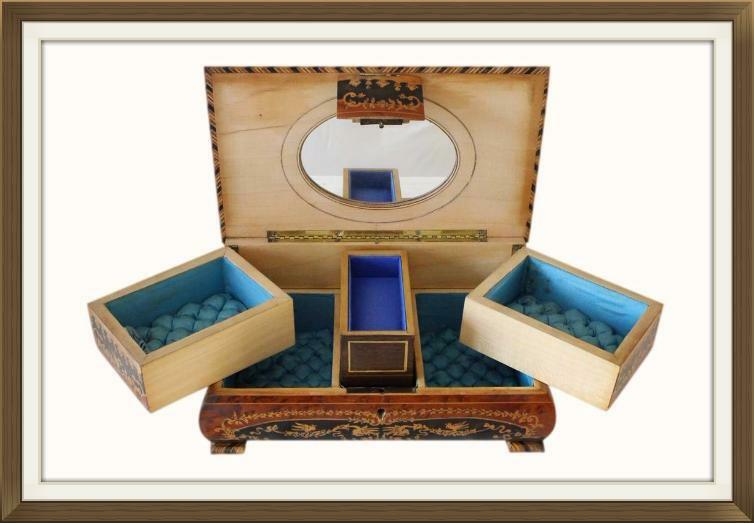 The box is beautifully finished with inlaid Satinwood stringing and borders. 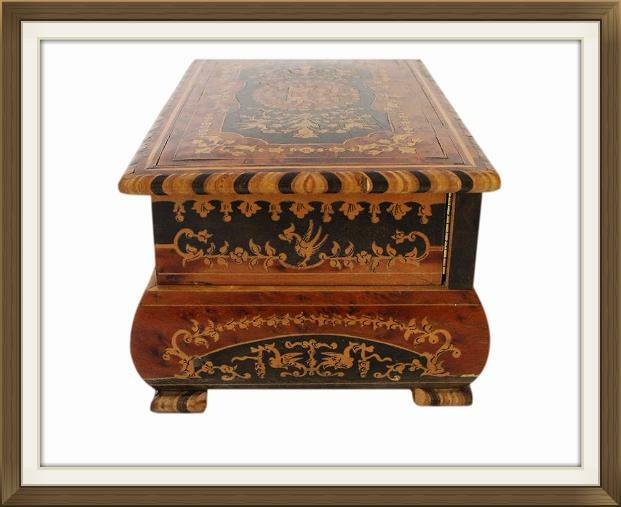 There is a vast amount of detail to the marquetry inlay which would've taken hours of skilled workmanship to complete. A lot of work and love went into the making of this box! 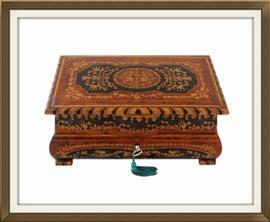 The box stands raised on beautifully shaped feet which are also decoratively finished with inlay. This inlay matches the outer inlaid frame on the lid. The box is complete with its original long piano hinge to the lid, and its original hinges to the interior compartments. All of these are quality 'stop' hinges which prevent the lid and the compartments from extending too far back. The lock flap has its original hinge also. The box has retained its original label on the bottom which states the song title of the music it plays. 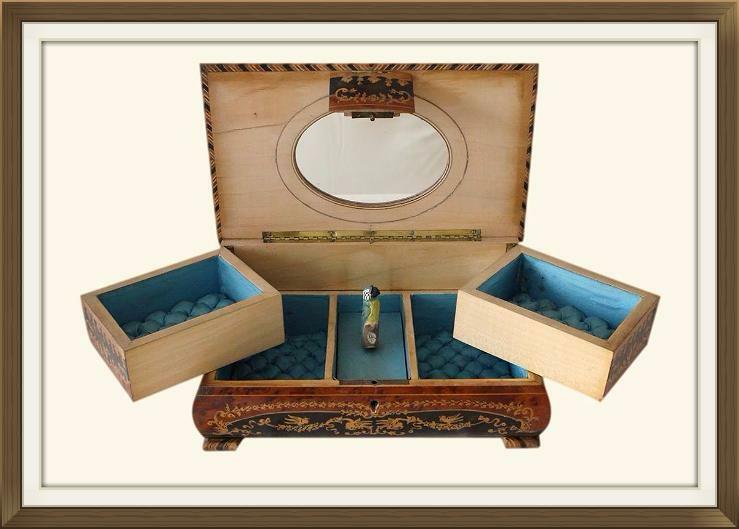 The interior is made of Satinwood and has two swing opening compartments at the top. There are two further compartments beneath those at the top, and the musical movement is nicely partitioned between these. There would have originally been a ballerina upon the cover to the musical movement. This has been replaced by our skilled restorer with a nicely carved and painted Parrot! The Parrot turns from side to side and bobs up and down when the musical movement is operated. He is quite charming and amusing to watch! 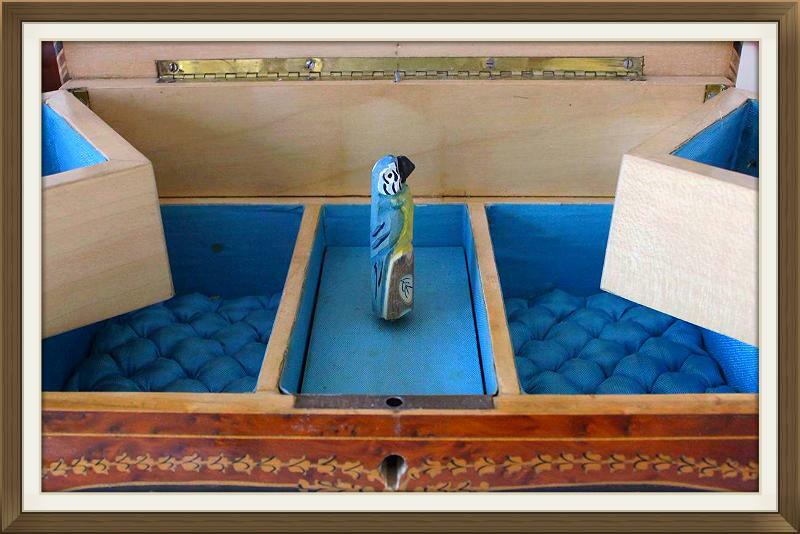 Our restorer has also made a new bespoke box, which fits inside the partition of the musical movement. You can choose to display this box or the parrot, depending on your preference. You simply lift the Parrot up and out of its metal tube to remove it. The swing compartments and those beneath are complete with their original powder blue satin linings. The bases to these are padded and quilted. 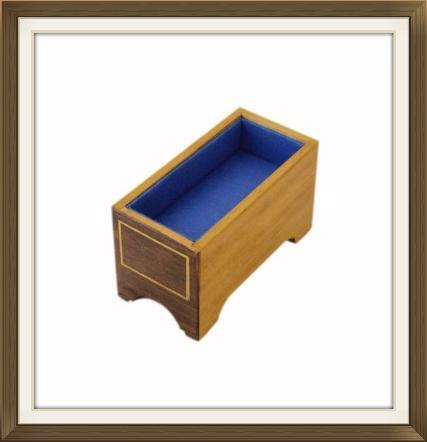 The bespoke handmade box has quality lap joints, and a decorative gold painted frame to the front. It has a padded blue satin panel to the base and blue satin linings to the interior walls. You can meet our wonderful restorer Jim by visiting our About Us page. His work is always of a very high quality, and he puts a lot of love into whatever he undertakes! The inside of the lid has its original inset oval mirror. This is nicely framed by inlaid stringing. The box is complete with its original lock which is in excellent working order. It has a replacement vintage style key which has been fitted to the lock. Please see below for further information in relation to vintage locks. 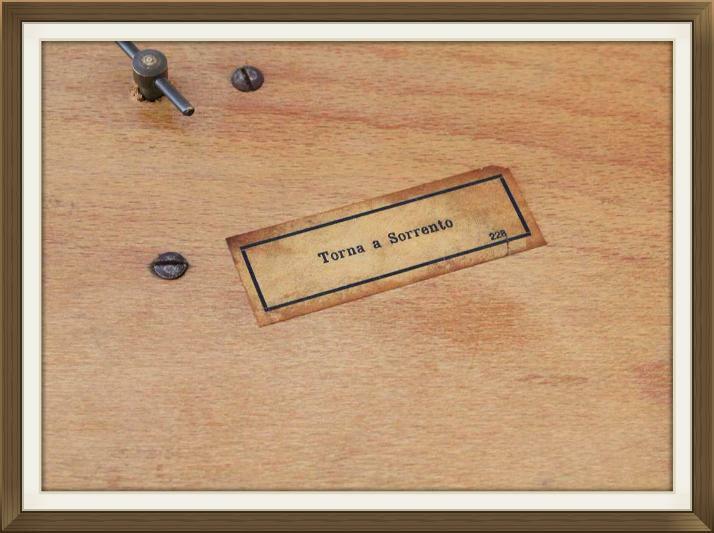 The movement plays the beautiful Italian tune 'Torna a Sorrento'. The English translation of this is 'Come Back To Sorrento'. It is a beautiful Neapolitan song (originally spelt 'Torna a Surriento') which was composed in 1902 by Ernesto De Curtis. The song has since been sung by numerous performers such as Elvis Presley, Frank Sinatra, Dean Martin, and each of the three tenors, to name just a few! The musical movement is operated via the winding key on the bottom of the box. 5 turns of the key are sufficient to wind up the movement. The music stops as it should, when the lid is closed, or when the movement is fully unwound. Please see below for further information on musical movements. This wonderful box is in excellent condition for its 60 plus years of age. All of the inlay is present and intact, and the box is structurally sound. There is minor 'rippling' to the inlay on the lid which is in no way unsightly in our opinion. The interior linings on the whole are very good, with no splits or fraying. They do however have some staining, particularly the satin to the right swing compartment. This is as we'd expect with a true vintage box that has been loved and used for its purpose. Please look at all of the photos provided for a visual view of the condition of the box. Boxes with age related wear and stains are not to everyone's taste, so please bear this in mind before purchasing this box. Thank you. Each 10.5 by 7.2cm with a 3.5cm depth. 11.6 by 8.0cm with a 4.0cm depth. International postage is £25, by Royal Mail International Tracked and Signed post. Delivery is fast within 3-5 working days to Europe, and within 5-7 working days to the rest of the world. Enjoy £10 off your 1st order plus free next day delivery, on any piece of jewellery. Valid for both single and multiple purchases. See website for details.